Students at New City College, Epping Forest, have helped us put together our Heart your Hospice community art project! 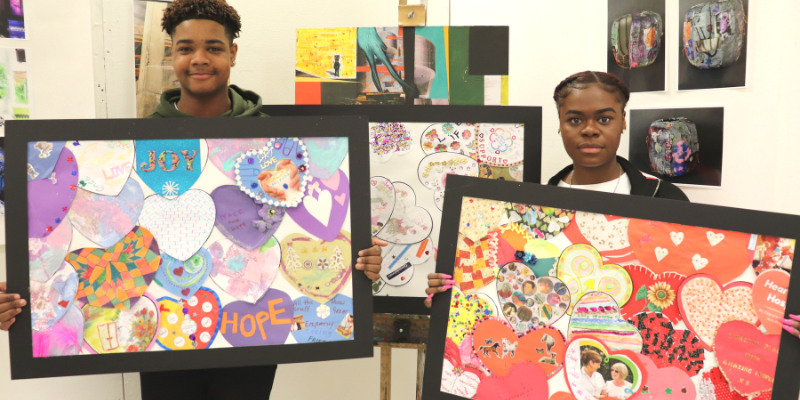 St Clare Hospice has enlisted the support of local students at New City College, Epping Forest, to help put together the fruits of a four-month community art project called ‘Heart your Hospice’. The ‘Heart Your Hospice’ community art project launched in October 2018, as part of our campaign for Hospice Care Week (8th-14th Oct) – a nationally celebrated awareness-raising week around hospice care in the UK. Closing on Valentine’s Day (14th February), we collected more than 150 decorated paper hearts from local people in the community throughout the duration of the four-month project. In total, we received more than 150 hearts, comprised of postal entries from local people; from St Clare patients, staff and volunteers; and from groups within the community.